Vit. C Strong 500 500 100 caps. 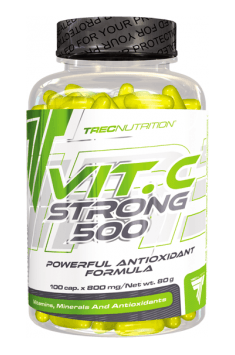 The supplement provides a big dose of vitamin C together with components that enhance its action. Prophylactically it is enough to take 1 capsule a day. During an infection or a cold, the dose can be increased. Due to the zinc content, one should not take the supplement with calcium-rich products that block its absorption. People who practice sports should know that reactive oxygen forms that appear during an intense physical activity play an important role in the exercise adaptation process. Increasing the supply of antioxidants may block this process, so the supplement should be used away from the training time.